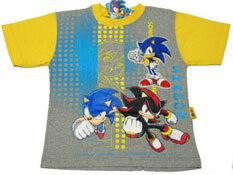 More new and fun clothing to collect for 2008-all seasons. GAME is still producing shirts, but another store NEXT is getting in on the action also. Keep an eye on the mystery company as well, they're going wild with loads of variant color designs! 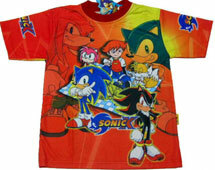 Choose your favorite, then shop in Europe or bid on Ebay to get these fresh looking Sonic X shirts for yourself. Reminder: *Always* check the size before bidding on Ebay, these may range from tiny-kid to regular adult sizes. 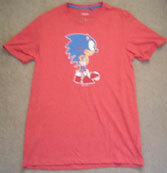 The 'fake vintage' shirt is a pre-faded red color, with 'pre worn out' classic Sonic design. With the close-up you can see the pitting, wear and holes they've purposely added to the paint to make this look old and used, before you even buy it. NEXT is a store in England. 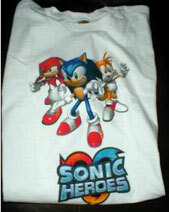 This is a promo-item (obviously) for Sonic Heroes. This company is going wild with color variants! 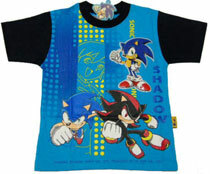 Here you can choose from 4 different versions of the same Sonic/Shadow/Chris shirt. This appears to be the company's first long sleeve (or possibly three-quarters) sleeve offering. Curiously as well, the shirts are essentially opposites. Where the sleeves are red, they are blue. Where the squares are dark/light orange they become dark/light blue. It's the same for the collars. 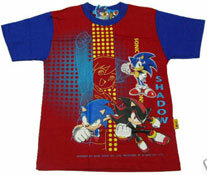 It is interesting to see such directly opposite colors creating a varient shirt. 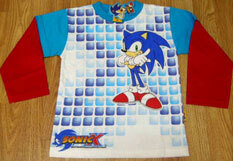 The Sonic is printed on, and is standing infront of gradient shaded rounded boxes, forming a large 'pixel' "X" for Sonic X. The logo of course, is in the corner, as they generally like for this to be pretty big among the designs. 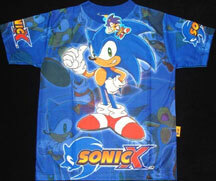 Announce to everyone your association with Sonic with this shirt. 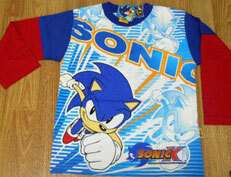 No one's seen the last of the spandex, with this shirt. 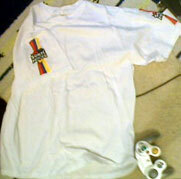 This is another 'cycling-type cloth' shirt. 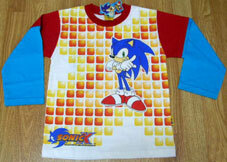 The all-over design has various Sonic X stock arts, such as arm cross, pointing, jumping and standing. These are done in an almost water-marked blue tone style for the background. 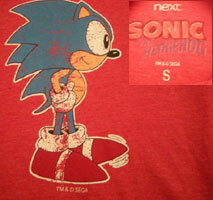 The main image is 'thumbs up' Sonic over a large Sonic X logo. Two more full color logos are on the sleeves. 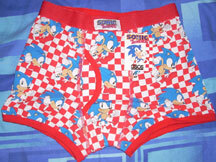 No special ink is ever used on these, so the fabric is just dyed with the colors to create the design. Available in 2008. Here come more of mystery co.'s shirts! This time it's a simple drawing of 'front punch' Sonic with several line-screen/watermark style copies in the background and a big name. Unlike their previous efforts, these are long sleeved, but they do not appear to be a true under-sleeve like what the USA's Top Heavy uses. The green variant though, is rather loud! Both photos found by FinalApocalypse. 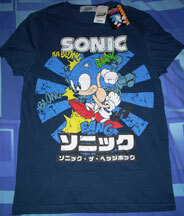 Here's a shirt that was actually a prize at the Summer of Sonic event! This shirt takes a nice and different approach. 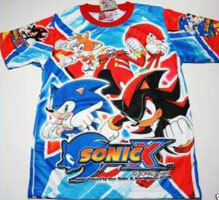 Using run/behind Sonic X style Sonic, it makes the graphic so large that he spreads over onto the sleeve and takes up most of the side of the shirt. It's def. something different than what has come before, and it is not overly busy. 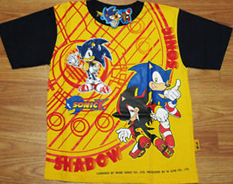 This wheel-like design/background shirt could be found in winter 2009. Available in 2 styles seen here, and mostly in kids' sizes, it's by the die-cut tag company again. 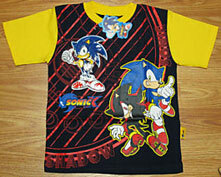 This shirt uses plastic-coated Sonic, along with some dynamic new Sonic X art for Sonic & Shadow. The cog/wheel like design adds interest to the background. 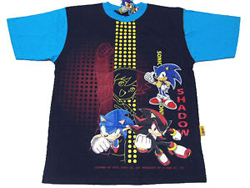 With not over-used art, this shirt is cool. The 'opposite variant' seen at bottom right appeared in 2010. Apparently they just like turning out shirts. Should still be kicking around ebay if you can find your size. For this mysterious company, 'lycra' seems synonamous with 'loud' and this shirt is no exception. Amid hot blue geomatric patterns, giant bright red letter 'x's and scatterings of small stock art groups (see sleeves) you can find 5 characters on this stretchy thin-cloth tee. 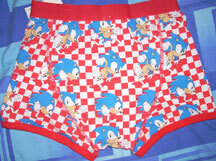 Tails, Eggman, Knuckles, Sonic & Shadow all appear but are caught up in the boldness of the all-over busy design. 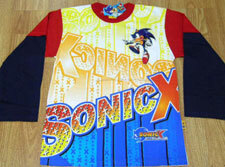 As usual, the front is the same as the back, and both sleeves have characters & the Sonic X logo on them. 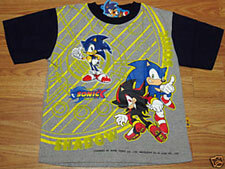 This shirt is available in winter 2009.